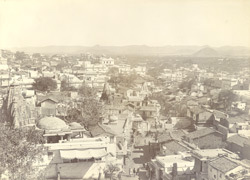 Photograph from the 'Curzon Collection: Album of views of Udaipur and Chittaurgarh', of a view of Udaipur from the south, taken in c.1905 by an unknown photographer. Udaipur is situated in a valley surrounded by hills and lies mainly to the east of three lakes: the Pichola, Fateh Sagar and the Umaid Sagar. It was founded by Maharana Udai Singh (ruled 1567-72) in the mid-16th century as the fourth and last capital of the Mewar state after the sacking of Chitorgarh, the previous capital. This is a general view from the south over the mansions, domes and temple shikharas of the city skyline towards the hills in the distance.